The earliest known application of encaustic wax paint dates back to the artists of ancient Greece. In fact, the word encaustic was derived from the Greek word enkaustikos, which means “to burn in.” The Greeks adorned boats and sculptures with wax paint. It soon spread to Egypt where it was used in the process of mummification. 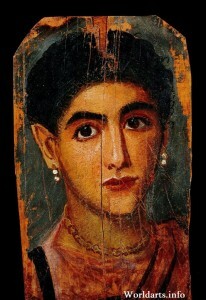 The well-known Egyptian Faiyum portraits (naturalistic painted portraits on wooden boards) were attached to mummies as memorials. Over 2,000 years old and now on display in museums, the Faiyum portraits remain intact with minimal cracking. Their colors have hardly faded with the passage of time and the detailed, realistic-looking facial features are impressive. Brucie Jacobs has experimented with many traditional (and not so traditional) mediums for her artwork. She finds encaustic to be not only one of the most versatile, resilient, and forgiving of mediums, but also appealing for its sensuality and tactile earthy qualities. One can paint, print, collage, gauge and sculpt with encaustic. The wax can be used to create multi-dimensional texture as well as smooth surfaces. Extremely durable, it is amenable to being combined with paper, fabric, photographs, three-dimensional objects, and other media. In her Macrovision, Skyscapes, and Facing East series, she immerses her photographs—archival pigment ink prints on lightweight mulberry-based Unryu and Kozo papers—in clear encaustic medium. The translucent quality of the wax surface lends an extra dimension to her photography. Although these works on paper can be framed, she typically displays them frameless, attaching them to the wall like free-hanging scrolls. They are available in the dimensions indicated, as well as in smaller custom sizes. The Unleashed pieces in Works on Paper involved pouring large amounts of pigmented encaustic on archival paper. While Jacobs maintains some control over the hot wax flowing across the paper, encaustic tends to have a life of its own, especially when poured; the end result of a pour is determined as much by the wax’s spontaneity as by any manipulation or artistic design. Jacobs’ poured paintings are framed in order to protect any un-waxed areas of the paper. (Note that the occasionally large amount of encaustic spilling on the floor is not wasted, but saved for future use.) Prints are available in various sizes. The encaustic Monotypes selected for Works on Paper were created on hot metal plates. All works are original because only one print—the “mono” print—can be pulled from the plate, removing the encaustic paint. 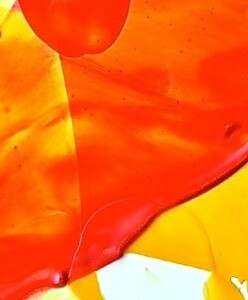 If enough encaustic remains on the hot plate, a ghost image may be printed. Papers chosen for the Monotypes include fragile, absorbent Japanese paper as well as heavier watercolor and other archival papers. Each Monotype is framed. Prints are available in various sizes. Jacobs also paints on rigid wood panels, their surfaces absorbent enough for molten wax to adhere. 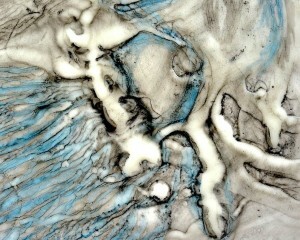 See Encaustic Works on Wood/Paintings. Jacobs paints layer upon layer of pigmented wax, fusing each layer with a heat gun or propane blowtorch. It is the heat and the fusing process that bond the layers of paint together permanently. She typically scrapes, gouges, and makes marks on the wax in order to achieve certain effects, then again fuses with heat. She sometimes collages paper, fabric, metallic pieces, and other elements into the painting. Some of the paintings on wood are framed; others are not. Prints are available. In addition to painting encaustic on wood, Jacobs attaches photographs to smooth wood panels, then paints the photographs with clear encaustic medium until she achieves a smooth, even surface intended to imbue the photographs with qualities of permanence, mystery, and fragility. The pieces shown in Encaustic Works on Wood/Photographs are representative of this series. All are framed. Although Jacobs’ favored medium is encaustic, she works with other mediums, in particular Oil Pastels. Using her fingers to apply pastel to paper, her imagination takes over, leading her to create what she calls “child-like, whimsical” works.